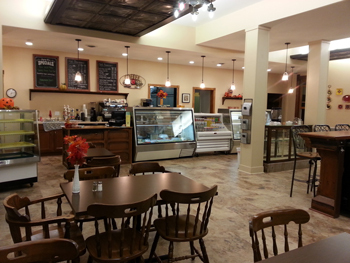 Enjoy eating breakfast or lunch in our newly remodeled cafe. Our breakfast menu features egg sandwiches, burritos, quiche, baked French toast and daily breakfast specials. For lunch enjoy homemade soups, salads, and sandwiches. We strive on serving high quality meats and cheeses and make most of our dressings and sauces in house. Our menu changes seasonally so check back for the latest version. We offer a full line of espresso and coffee drinks and full bar service.